The eruption in Halema‘uma‘u Crater that began in March 2008 is the longest summit eruption of Kīlauea Volcano, on the Island of Hawai‘i, since 1924. From the time the eruption began, the new "Overlook crater" inside Halema‘uma‘u has exhibited fluctuating lava lake activity, occasional small explosive events, and a persistent gas plume. The beautiful nighttime glow impresses and thrills visitors in Hawai‘i Volcanoes National Park, but the continuous emission of sulfur dioxide gas produces "vog" (volcanic smog) that can severely affect communities and local agriculture downwind. U.S. Geological Survey scientists continue to closely monitor the eruption and assess ongoing hazards. Patrick, Matthew, Orr, T.A. 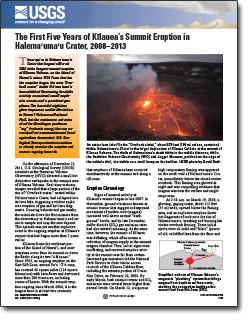 Sutton, Jeff, Elias, Tamar, and Swanson, Don, 2013, The first five years of Kīlauea’s summit eruption in Halema‘uma‘u Crater, 2008–2013: U.S. Geological Survey Fact Sheet 2013–3116, 4 p., https://dx.doi.org/10.3133/fs20133116.